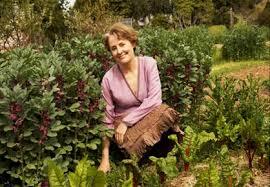 Those of you who live in the Bay Area, and many of you who don't, are familiar with Alice Waters. She's credited with creating "California cuisine" as the owner of Chez Panisse, a Berkeley restaurant in business for over 40 years. She's known for using local, organic food and it's consistently rated as one of the top 50 restaurants in the world. If you've been, go again and next time, take me won't you? As they say on the ESY website, "The mission of the Edible Schoolyard Project is to build and share an edible education curriculum for kindergarten through high school. Our vision is for gardens and kitchens to become interactive classrooms for academic subjects, and for every student to have a free, nutritious, organic lunch." Since they started 17 years ago, ESY has served over 7,000 students and now operates in 2226 locations in 11 countries! All I learned about food in middle school was that a tunafish sandwich left unrefrigerated in your locker all morning won't kill you if you eat it, though it probably should. I share this only so you can make an informed decision if you're invited to dinner on the same night by me and an ESY graduate. There are online resources for educators, parents and advocates who want to share edible education lesson plans and best practices. If you, like me, just want to eat - there are recipes there too! You can register for the next tour of ESY Berkeley on June 6th at 9:00am, attend their annual Mothers' Day fundraising plant sale or at least like them on Facebook so you'll always know what's happening.